Kenttälääkintäkurssimme perustuvat TCCC-periaatteisiin, joten koulutus on täysin yhteensopivaa mm. Puolustusvoimien nykyisten oppien kanssa. Alla tarkemmat tiedot kurssitarjonnastamme. Kysy myös räätälöityjä koulutuspaketteja. A dynamic emergency course, Traumatic Emergency Casualty Care is based on a proven system developed by US Special Operations to address traumatic injury within in a proven, common-sense framework. 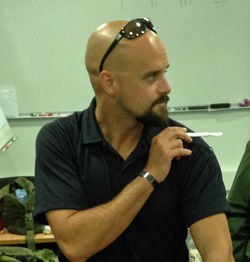 This fast-paced course will walk you through how to quickly evaluate casualties, address life threats and treat patients in all environments from hostile to permissive. You will learn triage, extrication techniques, tourniquet choice and use, airway management and CPR, MARCHH casualty evaluation and treatment, emergency cricothyrotomy, and patient packaging. Dominic was a member of the US Army for eight years. He served an Infantryman and Special Forces soldier. He is a graduate of the Special Forces Q course (18D), he specialized in emergency medicine. Nic was present in some of the heaviest fighting in Iraq and his unit was one of the highest decorated units in that conflict. He further participated in numerous direct action raids as a member of Special Forces. He holds numerous advanced medical ratings and specialized treatment certifications. He further completed the combat diver course and numerous courses during his tenure with the US Army. He possesses extensive real world combat experience treating wounded. He has multiple and numerous combat deployments in support of GWOT to Afghanistan, Iraq and other regions of the globe. He has earned numerous combat awards, Combat Infantryman badge and many others. Kurssin opetuskieli on englanti, mutta tarvittaessa tulkkaus onnistuu.